Amhuncham.org gives an account of the business meeting of the Budapest Business Club held in the General Consulate of Hungary in New York on 12 April. In the framework of the event, László Krisán, Vice President for the Hungarian Chamber of Commerce and Industry (MKIK), and American people in business, some of whom are members of the American Hungarian Chamber of Commerce of New York (AmHunCham NY), met to talk over business-related questions concerning America and Hungary. During the business meeting, new stages of the Hungarian-American relations have also been discussed strengthening the ties between the two countries. 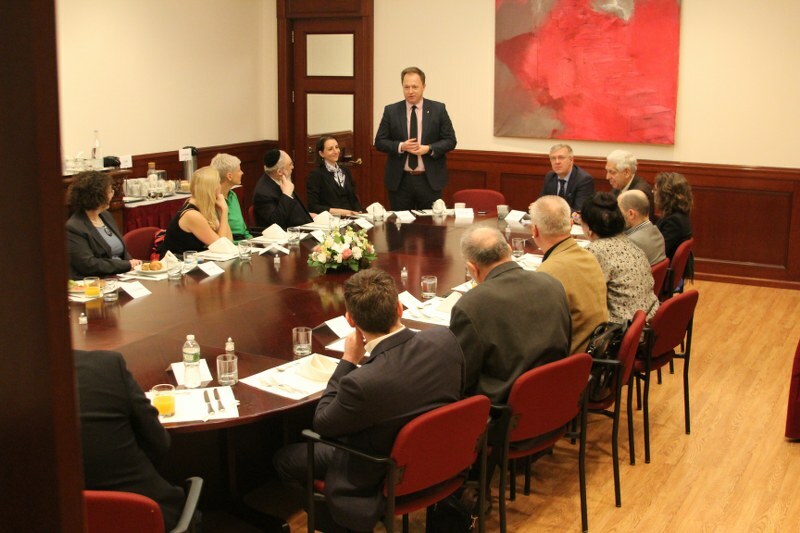 It is the American Hungarian Chamber of Commerce of New York that operates the Budapest Business Club and regularly organises American-Hungarian business meetings. The most recent meeting was organised on 12 April where, besides American businesspeople with Hungarian relations, Hungarian experts travelling to New York for the occasion also participated. During the conference, László Krisán, Vice President of the Hungarian Chamber of Commerce and Industry, and Tamás Barát, President of the American Hungarian Chamber of Commerce of New York, delivered a speech to the audience who could also get to know the latest members of the AmHunCham NY in the framework of the event. Judit Czakó Economic Attaché at the Consulate General of Hungary was the host of the meeting, who invited Dr Ferenc Kumin, Consul General of Hungary in New York, to welcome the experts. Among the audience, American businesspeople from New York, Florida and New Jersey were present while Hungarian experts from Budapest and Miskolc also travelled to the event. László Krisán, Vice President of the Hungarian Chamber of Commerce and Industry, informed the participants about the opportunities present for small and medium-sized businesses and highlighted the Széchenyi Card Programme, introduced in 2002, which works well in Hungary helping smaller enterprises. Furthermore, he also added that the KAVOSZ Zrt that is operating the Széchenyi Card Programme and that makes the development of the SME sector and the promotion of investments and improvements possible was established by the National Association of Entrepreneurs and Employers (VOSZ) and the Hungarian Chamber of Commerce and Industry. Tamás Barát highlighted particular business opportunities offered by the chamber the major activity of which “is the so-called ‘business mediation’ aiming to help its members with their business affairs not excluding businessmen and enterprises outside it either.” Concerning “business mediation”, the owners of the Fibraco and the Lion’s Regional Center talked about the investment opportunities lying in America and Hungary. Furthermore, it was also announced that the AmHunCham NY helps Hungarian entrepreneurs in joining the SelectUSA program facilitating job-creating business investments. Moreover, an international marketing expert living in Florida, Piros Pazaurek, also delivered a speech highlighting that many Hungarian enterprises still do not understand the different way of thinking present in American business life. This is from where the distinct American business concept also stems to which Hungarian companies need to adopt on the American market. Consequently, without local knowledge and familiarity with the language, business activities cannot work successfully, but the AmHunCham NY can help in improving it with the assistance of the Small Business Administration. After the business breakfast, negotiations started, for instance, between the owners of the Beautyrobic of Budapest and the Marketing X-Rays enterprises to discuss how to set up a Hungarian franchise network in the USA. The discussion touched upon the need for further development of the Hungarian speech recognition system, the ABSONIC, to make it available on the market, too. Finally, László Krisán suggested strengthening the collaboration between the Hungarian Chamber of Commerce and Industry and the American Hungarian Chamber of Commerce of New York in order to make improvements in the business life of the two countries.